I heard back from Lark Books today, (see my post from February 7th). 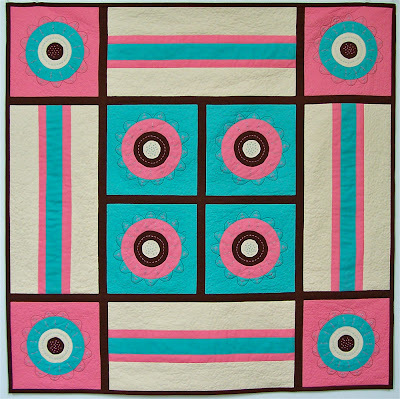 My baby quilt, shown here, was not selected. I think I knew in my heart all along that it wouldn't be. 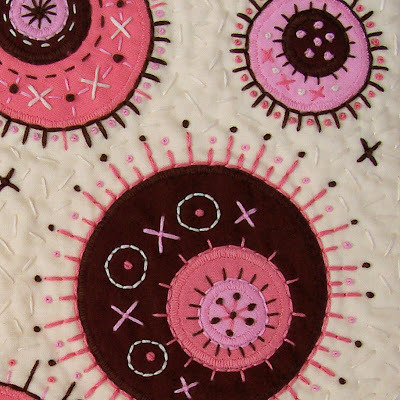 It's a lovely quilt. And very well made. 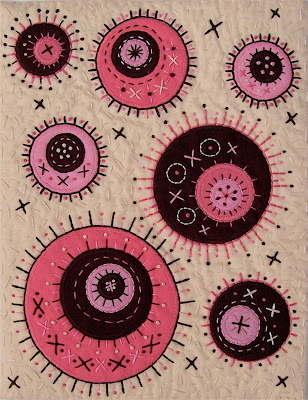 But I knew that they originally approached me, asking if I would submit a design, based on my small art quilts. 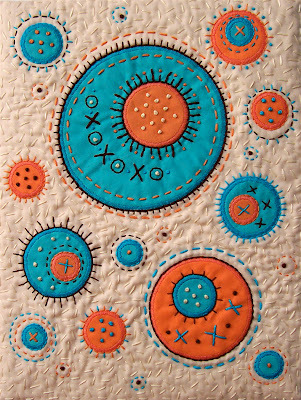 And I knew that the energy of this larger quilt wasn't the same. (Nor was my attitude in making it. Despite how much I wanted to succeed.) Throughout the whole process, my shoulders were hunched and I swore like a longshoreman who'd been away at sea way too long. Not very good mojo to put into a baby quilt! I have always enjoyed expressing myself on a small scale. It suits me. It's my language. I understand it. But have me work on a large scale, and I lose my vision. I feel like I am sitting in the front row, looking at a mega sized screen. I can't take it all in, my body hurts, I want to move away. Ahh, but it turned out there was a very nice, and unexpected twist. The good people at Lark Books said that they liked my small art quilts so much, that they decided to add some smaller scale wall quilts to the book. 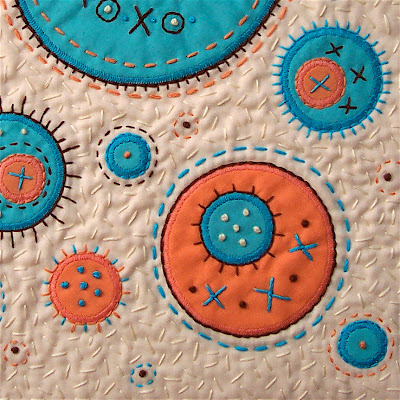 They have requested that I send them my "HoJo Space Spores", ( see post from February 14th) and have asked me to make two more quilts based on two of my other designs, and done in the HoJo colors! 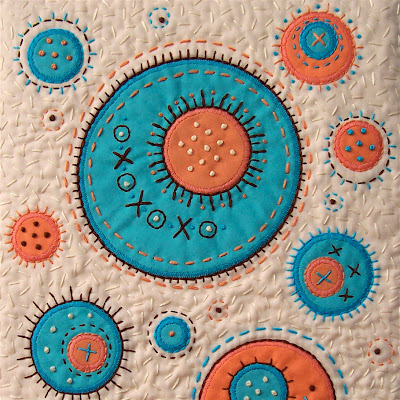 And by the way, they were kind enough to offer me another go at making a larger baby quilt, based specifically on one of my designs in my etsy shop. I really appreciated the offer, but respectfully said no thanks, and they graciously understood. I have decided that life and art are just too precious to me to try and force myself to fit into a mold that I just don't feel comfortable in! Thanks to everyone for their encouragement and good wishes! The book is due to come out in the Spring of 2009, I will keep you posted on any more updates! HoJo Space Spores or Where Have All The Howard Johnson's Gone? What in the world is a HoJo Space Spore? They are the fragmented memories of my childhood, where Howard Johnson's Restaurants feverishly dotted the american landscape and were never more then an exit away. Whatever happened to the familiar orange and blue roofed eateries? I imagine they are now little orange and blue space spores, floating through the galaxy, in search of new frontiers and gastrointestinal tracks. It all goes to show that inspiration for art can come from anywhere, folks!